For the suburb of Edinburgh, see Oxgangs. An oxgang or bovate (Old English: oxangang; Danish: oxgang; Scottish Gaelic: damh-imir; Medieval Latin: bovāta) is an old land measurement formerly used in Scotland and England as early as the 16th century sometimes referred to as an oxgait. It averaged around 20 English acres, but was based on land fertility and cultivation, and so could be as low as 15. An oxgang is also known as a bovate, from bovāta, a Medieval Latinisation of the word, derived from the Latin bōs, meaning "ox, bullock or cow". Oxen, through the Scottish Gaelic word damh or dabh, also provided the root of the land measurement 'daugh'. "in the eastern district there is a uniform system of land denomination consisting of 'dabhachs', 'ploughgates' and 'oxgangs', each 'dabhach' consisting of four 'ploughgates' and each 'ploughgate' containing eight 'oxgangs'. "As soon as we cross the great chain of mountains [the Grampian Mountains] separating the eastern from the western waters, we find a different system equally uniform. The 'ploughgates' and 'oxgangs' disappear, and in their place we find 'dabhachs' and 'pennylands'. The portion of land termed a 'dabhach' is here also called a 'tirung' or 'ounceland', and each 'dabhach' contains 20 pennylands." In Scotland, oxgang occurs in Oxgangs, a southern suburb of Edinburgh, and in Oxgang, an area of the town of Kirkintilloch. In England, the oxgang was a unit typically used in the area conquered by the Vikings which became the Danelaw, for example in Domesday Book, where it is found as a bovata, or 'bovate.' 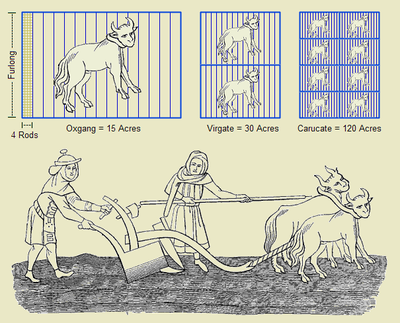 The oxgang represented the amount of land which could be ploughed using one ox, in a single annual season. As land was normally ploughed by a team of eight oxen, an oxgang was thus one eighth the size of a ploughland or carucate. Although these areas were not fixed in size and varied from one village to another, an oxgang averaged 15 acres (61,000 m2), and a ploughland or carucate 100–120 acres (0.40–0.49 km2). However, in the rest of England a parallel system was used, from which the Danelaw system of carucates and bovates seen in Domesday Book was derived. There, the virgate represented land which could be ploughed by a pair of oxen, and so amounted to two oxgangs or bovates, and was a quarter of a hide, the hide and the carucate being effectively synonymous. ^ Innes, Cosmo (1872). Lectures on Scotch Legal Antiquities. p. 283. ^ Cf. the Scottish acre. ^ See for example Roffe, D., 'The Origins Of Derbyshire', in Derbyshire Archaeological Journal 106, 1986, especially pp. 102, 110-1. ^ The true picture is however vastly more complex: see e.g. Stenton, F.M., 'Introduction', in Foster, C.W. & Longley, T. (eds. ), The Lincolnshire Domesday and the Lindsey Survey, Lincoln Record Society, XIX, 1924, especially pp. ix-xix. This page was last edited on 13 August 2018, at 13:16 (UTC).